Bracelet Details: Charles Krypell ivy link sterling silver and 18k yellow gold design. Measurements:7.25 inches in length. Ivy links measure 17mm in length and 5mm in width. Smooth links measure 22mm in length and 18mm in width. 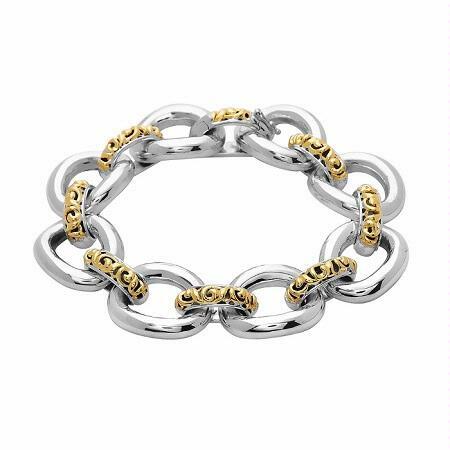 This is a fantastic Charles Krypell ivy link sterling silver and 18k yellow gold bracelet. Bracelet measures 7.25 inches in length. Ivy links measure 17mm in length and 5mm in width. Smooth links measure 22mm in length and 18mm in width. We are an authorized Charles Krypell dealer. Please call for pricing 1-800-790-6980 or 1-212-302-2863.